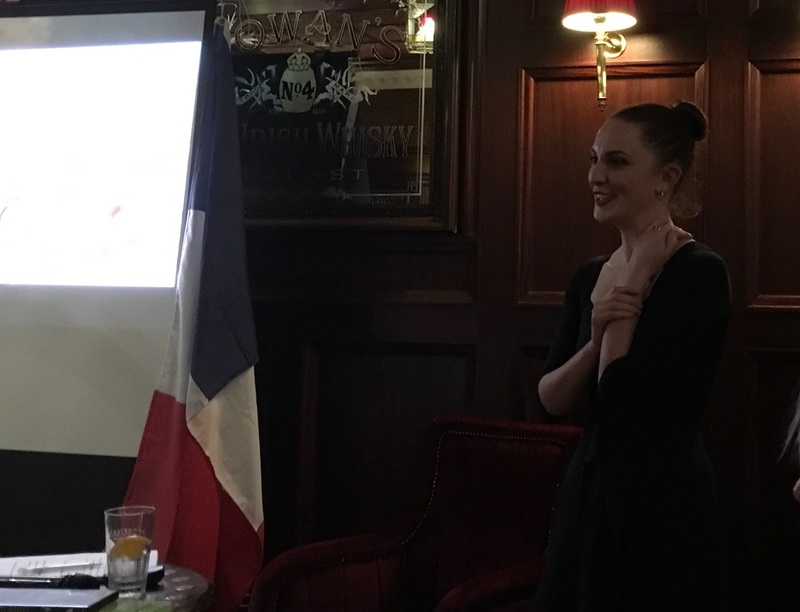 The café-causerie event this month took the form of a quiz night billed as le plus grand quiz français de Belfast. It was a thoroughly enjoyable evening which made for plenty of social interaction. 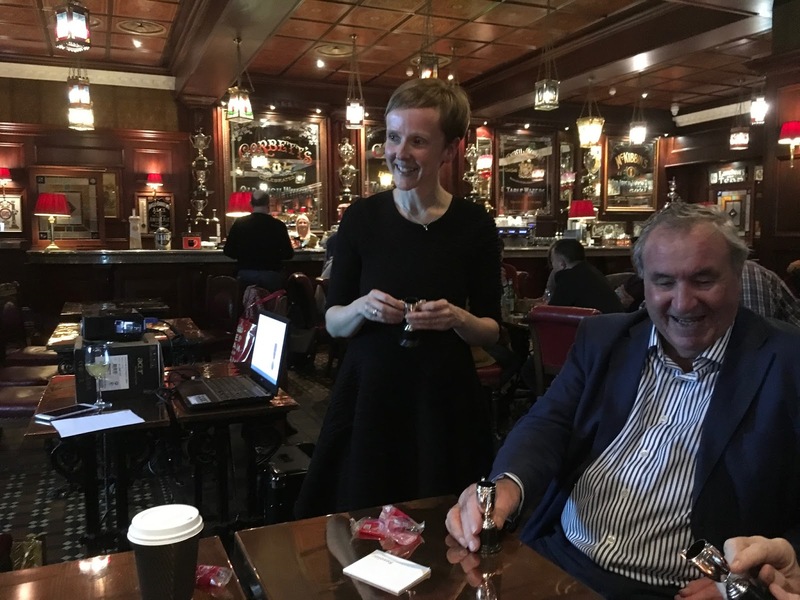 Our présidente Allison Neill-Rabaux was in charge of proceedings and was ably supported by her husband, Sylvain, and by colleague committee member, Drew Miller who managed the scoring process and kept tally on the various team positions. If anyone had been concerned that their level of French might have been insufficient for the rounds of questions then such doubts were quickly dispelled by the engaging format of the quiz. Allison and Drew arranged for attendees to form themselves into teams and to give themselves a group name. We ended up with half a dozen teams and a pad of response sheets was allocated to each. One of the rounds was picture-based and before the quiz got underway discussions about who was in the pictures got team members talking among themselves. Bringing us to attention, Allison quickly explained the quizzing process. There would be several rounds of six questions in each. The questions would be announced by Sylvain and be simultaneously displayed on screen. Plenty of time was given for teams to reach agreement on their group response and once recorded the response sheets were passed from one team to the other for checking. Allison returned to each question providing the correct answer on screen. For a few of these she took the opportunity to explain the response so the quiz was also an opportunity to learn something new. Drew then collected all the scores and compiled them onto a tally sheet. We had rounds among others on Culture, Cuisine, History, Sport and as previously mentioned a picture round with items of Franco-Irish connections. It was this last round that threw up an item that stumped the whole room. The picture was that of la petite maîtresse de Louis XV and Allison later was kind enough to share a biography of the woman in question to the Cercle’s Facebook group. If you haven’t yet subscribed connect here. As the evening progressed it was obvious just how much those present had relaxed into the quiz. There was a little tension as teams vied with each other for the top places but eventually Drew had calculated the winners, confusingly self-labelled as les perdus. Allison had thoughtfully provided little trophies to mark the successful outcome. It was a pity that trophies weren’t provided for Allison, Sylvain and Drew for their running if the quiz which was great, good fun and not in the least intimidating. Readers might like to remember that when it next comes round as we’re sure it will. When exactly? Now there’s a question. There was a full house last Tuesday night for Rachel Tracey's talk on Les Ballets Russes. It was a pleasure to see that I wasn't the only one who had been looking forward to it, and Rachel certainly didn't disappoint. In a very well scripted talk, delivered in a relaxed and engaging style, she took us from the foundation of Les Ballets Russes by Serge Diaghilev through his association with designers, such as Leon Bakst and Coco Chanel, choreographers including Fokine, and dancers like Nijinsky, Anna Pavlova and Tamara Karsavina, all of whom became legends in ballet. George Balanchine, whose name was later synonymous with the New York City Ballet, began his career with Les Ballets Russes. There were several pictures as illustrations, and we were referred to a unique, and only recently discovered, film of Les Ballets Russes in rehearsal. The financial perils of running a ballet company were not ignored. Diaghilev had been able to call on friends and family connections for patronage; however that source was not inexhaustible, and financial ruin was never far away. Diaghilev himself lived sparingly in a hotel room; even so, when he died, his friends had to club together to pay his bill. After Diaghilev's death, Les Ballets Russes had several subsequent incarnations, even at one time as two different companies, run as rivals by Colonel de Basil (The Original Ballets Russes) and René Blum (Les Ballets Russes de Montecarlo). There were, of course, financial constraints, as well as the immense problems of the Second World War. Colonel de Basil's company folded in 1952, and Les Ballets Russes de Montecarlo went bankrupt in 1968. Although Les Ballets Russes no longer exist, their legacy lives on. Their influence on design, choreography and style was immense, and has had lasting effects on ballet today. Rachel Tracey returns to share the story of Les Ballets Russes, the company originally formed by Diaghilev, and its several incarnations following his death. She will discuss how the company revolutionised both dance and art, and how its influence continues to this day. Rachel's talk will include a short ballet exercise. FOR THIS MONTH ONLY OUR MEETING MOVES FROM WEDNESDAY TO TUESDAY. Bal Feirste, the music group featuring both French and local musicians, invite you to their monthly session. 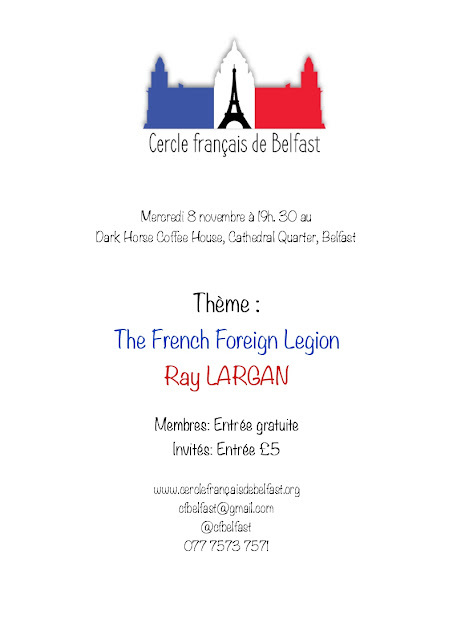 As you probably know Bal Feirste have been promoting French music and dance for a number of years. Remember no experience or partner needed. The Bal is a time to practise your moves and guidance will be given at the start of each dance. Culture Night is Belfast's largest, most exciting and inclusive cultural celebration. Now in its ninth year, Culture Night brings together over 300 free events across 150 locations in Belfast City Centre in a single day. The event attracts over 85,000 visitors from Belfast, Northern Ireland and beyond. Our friends in Bal Feirste will bring a note of French culture to Belfast's Culture Night with a session in Writer's Square from 9-10pm. Why not come along and join in the fun? I thought that you might be interested in the following events with a French connection happening in, or not too far from, Belfast. A big thank you to Hélène for pointing out that the film 'Ce qui nous lie' will be showing at QFT this month. The vineyards of Burgundy are the stunning backdrop for this French drama about estranged siblings putting resentments aside to save their family estate. After leaving the family home and wine business in search of adventure, Jean (Pio Marmaï) returns from a five-year absence when his father falls ill. Reentering a world and lives he left behind, Jean must re-establish a sense of trust with his angered family. Filmed over four seasons and taking full advantage of the alluring scenery, Cédric Klapisch (Chinese Puzzle) brings together emotional family drama, romance and mouth-watering wine into a winning combination. Luis Buñel's classic of desire and fantasy celebrates its 50th anniversary with a new 4K digital restoration. For more information and to see QFT's complete programme for September go to …. Our friend Jane Coyle has been in touch to let us know that her play “Both Sides”, previously stages at the Dark Horse as part of the Cathedral Quarter Arts Festival, is going on tour from 6 to 9 September visiting Old Courthouse in Antrim, Heaney HomePlace, Duncairn Centre on the Antrim Road, Belfast and Down County Museum in Downpatrick. Jonathan explores the network of French organisations around the world and the annual celebration of the French language and culture. Information on some events with a French connection taking place over the summer …. On 14th July 1792 the Belfast Volunteers marched through Belfast accompanied by many citizens and assembled 5,000 strong in the central courtyard of the White Linen Hall where they passed a resolution unanimously supportive of the French Revolution. on Friday 14 July 2017. The programme involves dramatic re-enactment by Paula McFetridge and Vincent Higgins, music and songs from Maurice Leyden and Jane Cassidy, debate and discussion. Please see attached press statement. 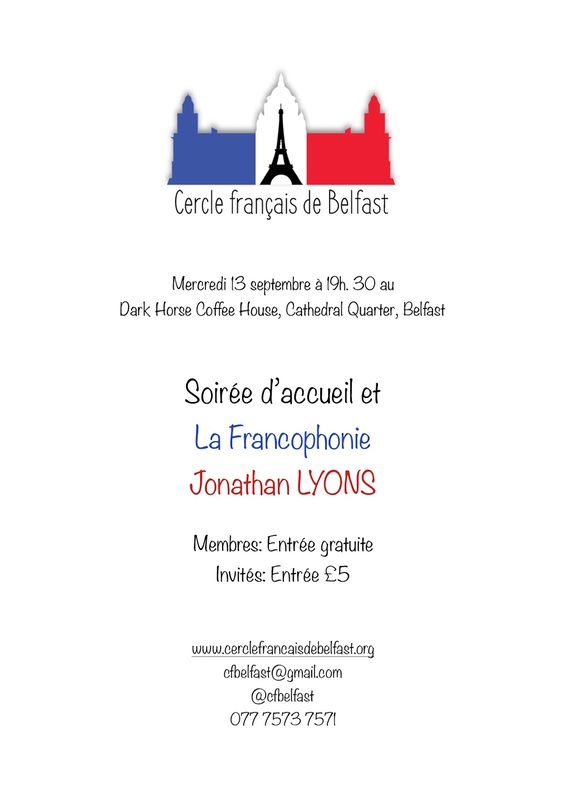 Thanks to Jonathan who brought to my attention the fact that, a little later in the summer (11th – 19th August), Barry Douglas and Camerata Ireland will present 'A Festival of French Music'. With concerts in the evening as well as at lunchtime and in the afternoon the Festival is set to be a celebration of all things French with a feast of Gallic artists and composers. Tickets are on sale from the Grand Opera House box office, and will also available on the night on the door.